The Raiders were soundly defeated this Sunday, like most Sundays, and in today’s press conference head coach Jon Gruden looked like his team played. He used to get excited about play-action passes to the fullback and pool noodles. 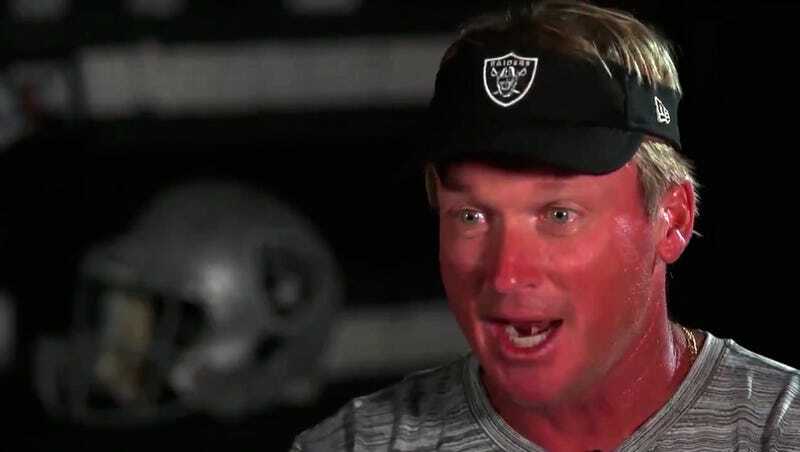 Now he’s visorless and haggard as he announces to the assembled press that the 1-5 Raiders have released their 35-year-old captain Derrick Johnson, who was on a one-year contract anyway. I’ll say this: We’re not tanking anything. I hear the hatred out there, some of the rumors that we’re tanking it to get a first-round pick, or a higher pick. We’re not getting up at 4 o’clock in the morning to tank it. Ain’t nobody tanking it. Sure, I regret some of them. I got a list of things I regret. I got a list of things. I’m sure you do, too. Unless you’re perfect, I don’t know. I don’t think any of us are perfect. We’re trying. We’re working hard. I’m not gonna never throw the ball on first-and-goal again. All my friends in the league do it. I haven’t talked to him yet, no. I’m sure I will. I know [defensive coordinator] Paul Guenther did. I heard there was a Twitter report out there. You know, Melvin’s on his seventh team, I think. He’s had different techniques. Maybe he’s confused. I don’t know. I’ll talk to him. But he’s gotta play better. He’s in a competitive situation. Perhaps he’s frustrated, and I can’t blame him. Derek Carr is sore, but we think he’s gonna be okay. Physically, maybe, but are you sure?